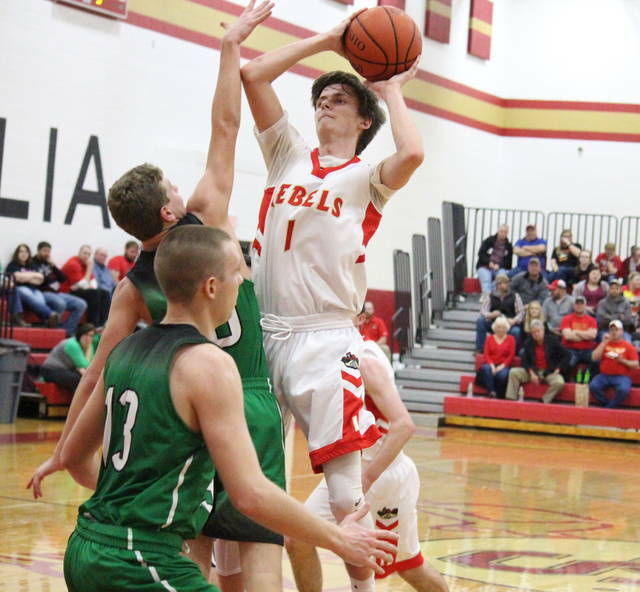 South Gallia senior Gavin Bevan comes up with a steal, during the first half of the Rebels’ 59-35 setback on Tuesday in Mercerville, Ohio. MERCERVILLE, Ohio — Unfortunately for the Rebels, there was no comeback this time around. 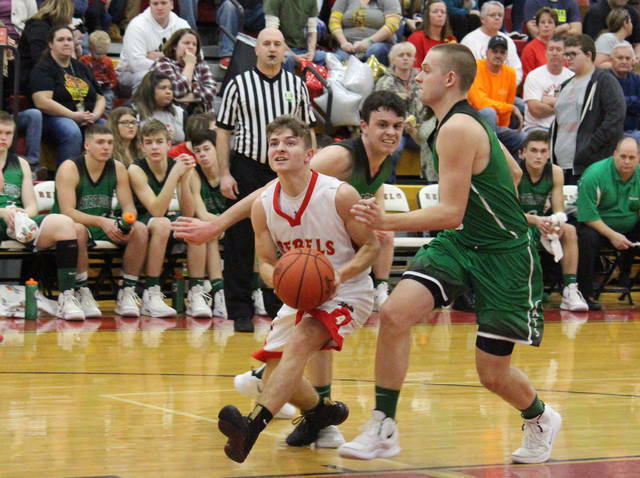 The South Gallia boys basketball team — which rallied back to take a 56-54 overtime victory at Waterford on Jan. 11 — couldn’t repeat its performance on Tuesday in Gallia County, as the visiting Wildcats claimed a 59-35 win in Tri-Valley Conference Hocking Division play. South Gallia (12-9, 7-8 TVC Hocking) led initially, but surrendered the last six points of the opening quarter and trailed 10-6 by the end of the stanza. Waterford (13-6, 12-3) had its lead cut to a single point twice within the first three minutes of the second period, but ended the first half with a 14-to-4 run and a 28-17 advantage. The Wildcat lead was stretched to 15 points within the opening 40 seconds of the second half, but SGHS fought its way back to within 10 points, at 39-29, with two minutes left in the third. The guests ended the period on a 9-0 run, however, and took a 48-29 edge into the finale. The Rebels were never closer than 17 in the fourth quarter and fell by a 59-35 final margin. Following the setback, SGHS head coach Kent Wolfe credited the Wildcats and pointed out the differences from the first meeting between the teams. “They jumped out us right off the bat, they were more physical than us and they were relentless on the glass,” Wolfe said. “The first time we played them, we beat them, but we got outrebounded significantly. From the very beginning, their guards took us off the dribble, that is something they did not do the first time. They took us off the dribble, got into the lane, created advantages and got easy layups. For the game, South Gallia shot 13-of-47 (27.7 percent) from the field, including 1-of-11 (9.1 percent) from three-point range, while Waterford made 24-of-44 (54.5 percent) field goal attempts, including 1-of-5 (20 percent) trifectas tries. At the foul line, SGHS was 8-of-9 (88.9 percent) and WHS was 10-of-14 (71.4 percent). The guests won the rebounding battle by a 32-to-20 count, including 11-to-9 on the offensive end. The hosts committed just 11 turnovers, five fewer than Waterford. 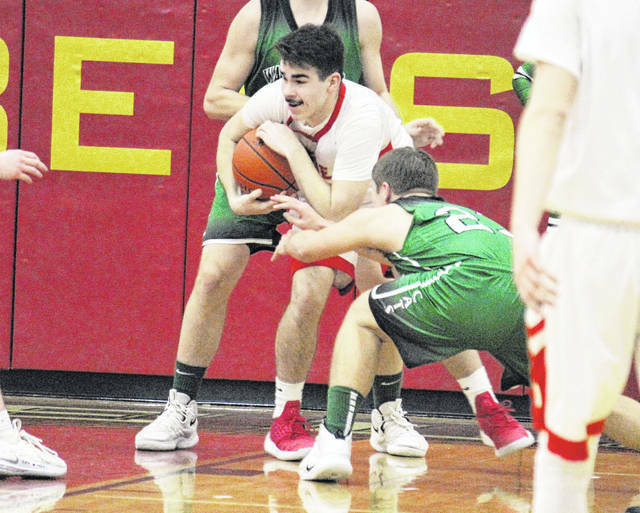 The Red and Gold collected nine steals, six assists and a pair of blocked shots, while WHS finished with team totals of 14 assists, 10 steals and five rejections. C.J. Mayse led the hosts with 12 points and seven rebounds. Braxton Hardy was next with 11 points, including the team’s lone trifecta. Eli Ellis had six points in the setback, while Garrett Saunders, Nick Hicks and Kyle Northup scored two apiece, with Saunders recording a team-high three assists, and Northup grabbing a team-best three steals. Russell Young paced the guests with a double-double of 17 points and 10 rebounds, to go with four assists and three blocked shots. Holden Dailey scored a dozen points in the win, while Nick Fauss and Zane Heiss had nine points apiece, with Fauss earning four assists and four steals. Wesley Jenkins and Peyten Stephens rounded out the Wildcat total with six points each. Prior to the game, SGHS honored its seven seniors, Braxton Hardy, Nick Hicks, Garrett Saunders, Eli Ellis, Gavin Bevan, Bryceton Folden and C.J. Mayse, playing in their final home game. 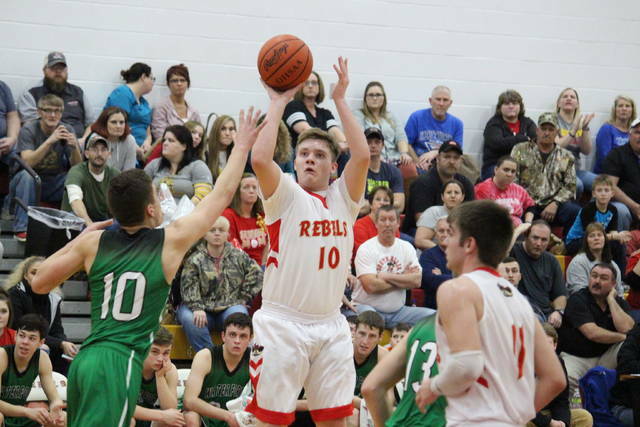 The Rebels wrap up the regular season on Friday at Miller and will then face the Falcons again in the sectional semifinal on Feb. 20 at Meigs High School.